This is Zoey, and like a lot of dogs I have helped train, she loves to play! She loves toys, loves to chase a ball, and loves to play tug. She is also very smart and so can get bored easily. Well who said that training has to be work, and boring, and well you get the picture. When it comes to teaching your dog something new, studies have shown that the majority of dogs learn things faster, and retain it longer when food was involved as a treat or motivator. However, that does not mean that you have to only use treats, especially if your dog happens to LOVE toys and play time. Lets say you want to teach something a bit challenging. How about "Stay" or "Leave It." 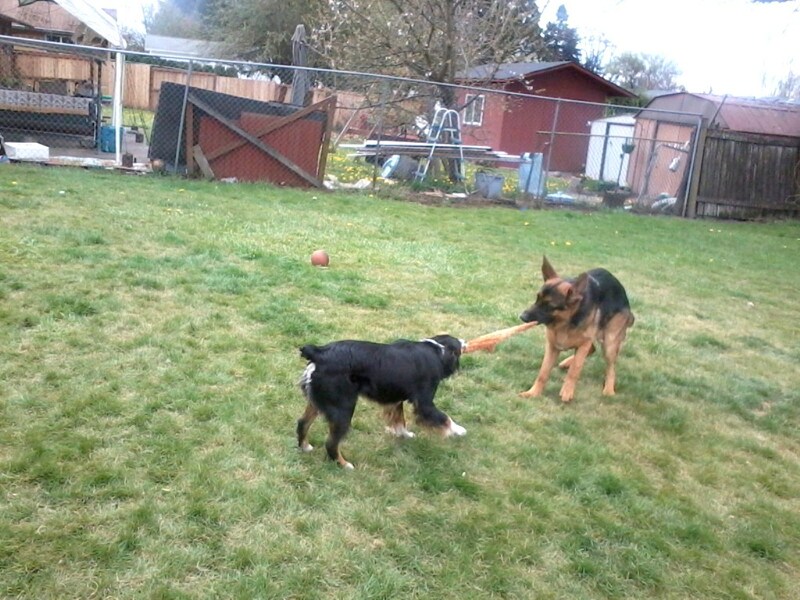 After you click for your dog's good job instead of the same old boring treats, why not spice it up a bit with a game of tug! I like to keep my training session time spent on "Stay" short (5 minutes or so) because it is a rather boring thing for the dog to learn. Adding toys into the mix can be a great way to liven it up! Make sure you give your release cue so the dog understands that it can play, you don't want to get things like that mixed up there. * Note that adding play into your training routine can get them very excited. I use it with dogs who don't care for treats, and or after I have done the ground work for that particular cue because they sometimes can get overly excited. *I use the clicker positive reinforcement to train my dogs Read here to learn more about that method. and how to use the clicker here. You might be asking yourself, wasn't the title of this "Treatless" dog training? Why is she talking about using treats still? Well, the fact of the matter is that for the majority of dogs food is the way to their hearts and heads, it's a proven fact. 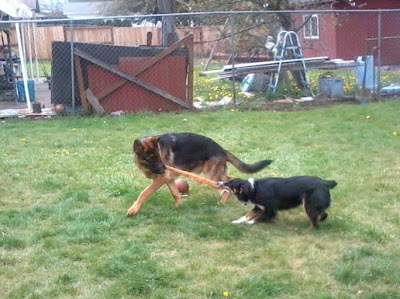 However there are those dogs who would rather play than do anything else in the world. For them all you need to do is modify the treat based methods and put a toy in place of a treat. If you are finding that they get too keyed up while training try reducing your training session time, or start off using a can of wet food for your reward most of the time, while throwing a toy or play session in for the other part. Mixing it up can be helpful with dogs that tend to get bored easily. 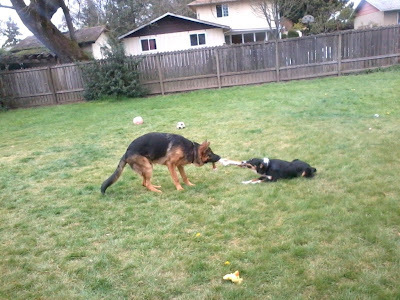 Teaching your dog to "Drop it" is a very important step when you want to add toys into your training routine. I will either hold a very strong smelling treat up by their nose (if they are being stubborn and don't want to drop what they have), or hold up a second toy. Make sure you then click as soon as the object is dropped, then they can have the treat or toy that you offered. Training means teaching, you don't have to just stick to the sit, downs, and stays. All dogs should be well socialized and understanding how to play is part of being a well balanced and happy dog. Dogs that play with toys are easier to to keep exercised. You can throw a ball or Frisbee for them to chase, or a game of tug can be wearing as well. If your dog pulls like crazy when you go out for a walk, try playing a game of fetch before you go out. It will help take the edge off their energy and make walking them a bit easier. Play it smart when your dog is running back to you with the ball, call his name and say come, then when he gets to you, click, then throw the ball again so the playtime gets to continue! That way you build a great positive for your dog to come back to you when you say come because in his mind that means PLAY! 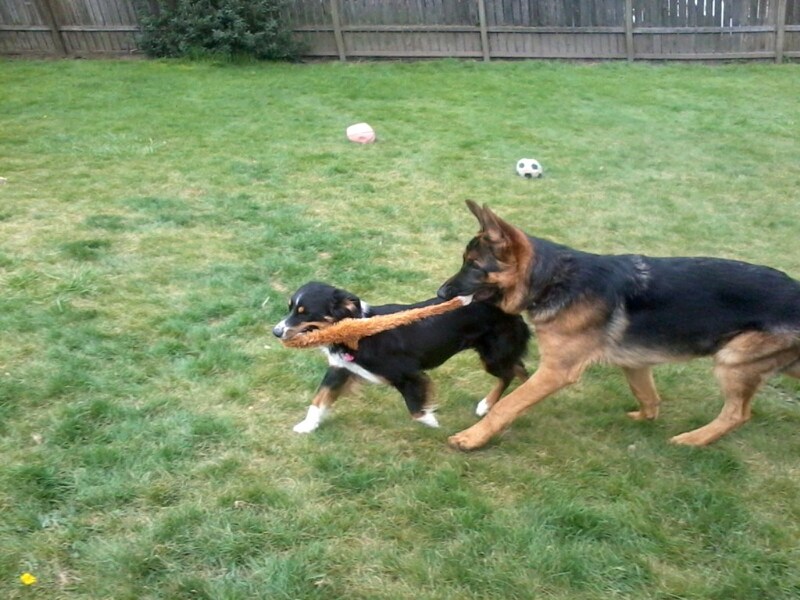 So don't be afraid to use toys while training, especially if your dog loves them! One of the biggest keys to successful training is using things your dog loves as a motivator, and being consistent in how, and what you are asking them to do. Indoor Agility Training the Weave Poles!